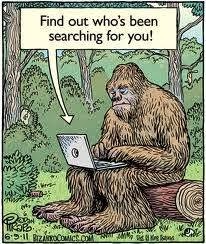 I'm a modern Bigfoot, a forest ape for the new millennium. I'm old school but new age. I mind speak while I tree peek. I play tic-tac-toe while I eat cookie dough. I spend time looking for pine nuts, hey are those donuts? I'm a laid back gentle forest person, but you should pack your gun. I'm aggressive while I hide but I don't mind walking by your side. When I'm angry I tear down trees but could you stop cutting them down please? I activate my cloak and that's not a joke. I like to sing and stack rocks, why are you wearing Crocs? My calls are over the top but I'm still under the radar. I kill deer and eat fish but only leave footprints. I have a coned head and a glide in my stride, but that's really just implied. I've learned humans are dangerous and only watch from afar, but watch me jump in front of this car! I hide while you seek, hey look a window! Let me take a peek! I can see infrared light. So nice try, I don't like my picture taken I'm a bit uptight. I take the occasional dive in the dumpster. Hey it's hard to be a great hunter! I'm whatever you need me to be! A true Renaissance Man, now excuse me I need to get back to my clan.